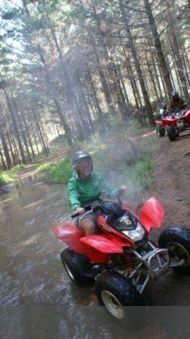 We cater to all levels of quad riding (novice, experienced, and experts). Your riding instructions are provided by a 4 Track Adventures professional motorbike guide. You will go through a practical training course on the bikes to ensure your comfort during the tour. A vehicle driving license is not required. All tours at 4 Track Adventures are fully guided to ensure your safety. Your guide will constantly be in touch with your progress during the safari, evaluating your skills and advising where necessary. The guide will cater the tracks to the riders capabilities. This tour covers between 15 and 20kms of stunning forest tracks and is tailored to suit the individuals riding capabilities. Ride high to our lookout and take in the spectacular coastal scenery, manoeuvring your bike amongst the trees and splashing through mud on the return journey. Age limit is 14 and above - doublers (including children between the ages of 5 and 13) pay half price with a full paying adult. Cost $189.00 per person or pick up/drop off inner city $239.00 per person. No experience needed. This tour covers between 25 and 35kms of forest tracks, which gets onto Muriwai Beach for a short blast before heading back into the forest tracks. Tailored to suit the individuals riding capabilities. Full instructions are given and the tour is fully guided. Age limit is 14 and above - doublers (including children between the ages of 5 and 13) pay half price with a full paying adult. Motorcycle / drivers license required. Cost $289.00 per person or pick up/drop off inner city $339.00 per person. No experience needed. This is an awesome ride which covers between 45 to 55kms of forest tracks and also Muriwai Beach, where we have a short break and provide light refreshments before heading back into forest tracks. No Experience needed. 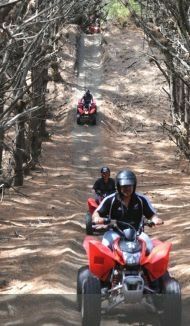 This tour covers between 25 and 35kms of forest tracks, which gets onto Muriwai Beach. Nice sunsets and different hues in the forest tracks. A great way to end your day. Cost $255.00 per person or pick up/drop off inner city $286.00 per person. 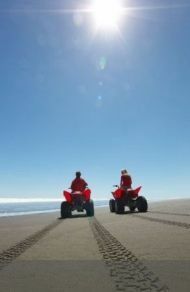 Combine the excitement of a helicopter flight with the adventure of a 4 wheel bike safari on Auckland's rugged West Coast. Trip includes - scenic helicopter, two hour 4 Track safari, shuttle return. Optional barbecue lunch. This package departs Mechanics Bay 9:00am and arrives back approx 1:00pm. Available on demand. Work up a thirst on an awesome adventure riding a 4 wheel motorbike through the forest and along a wild West Coast surf beach. Then quench it on the way home by visiting one of NZ's premier wine producing regions of which you'll visit the most prestigious wine makers in the Auckland area. Minimum numbers of 5 people is required. Trip includes lunch and pick up and return from Auckland. If you are looking for that special event or activity to entertain staff, clients or teams, try an adventure day or half day with us. More information on groups over 10 people.